Who would have thought I would run a half marathon PR in my 4th week of marathon training? Definitely not me! The week started out good with a solo run and a Georgie run on Monday followed by Run Club on Tuesday night. I took 2 days in a row off to get rest up for the Cape Cod Half on Saturday. I was exhausted! And I pulled a muscle in my chest—diaphragm or intercostal muscles perhaps? 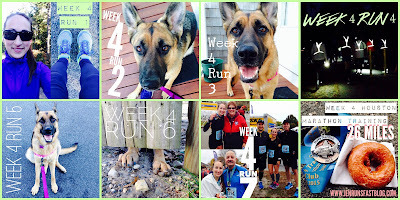 The Cape Cod Half was Saturday morning and I had so much fun! It was a big confidence booster heading into Week 5 of marathon training. I wasn't training for the Cape Cod Half but it just happened to fall so perfectly on a weekend I had a long run of 14 miles. My goal for the race was to stay relaxed the whole way and I really feel like I did just that. At 10 miles I knew I would PR if I maintained pace, which I did and maybe even pushed myself the last half mile or so. You can see my full race report here. A normal Run Jen Run post-race routine includes a lot of couch time but Georgie spent quite a bit of crate time race morning so when I got home, she would not let me rest. There were balls to be thrown, Georgie’s to be chased, and walks to be taken. I think this worked to my advantage. I was a little stiff getting out of bed on Sunday morning but nothing like I remember from previous half marathons. A little stretching, foam rolling, compression socks and spin class continued to help with my recovery on Sunday. · 12 weeks until the Houston Marathon! 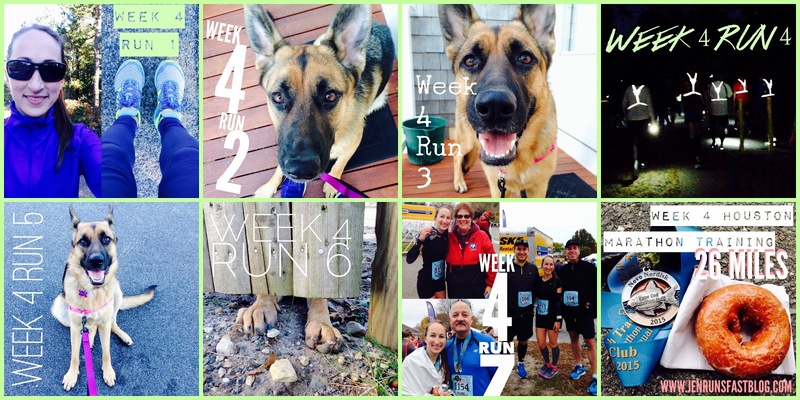 Cape Cod Half 13.1 miles (1:34:16) <--a PR!